By Walter J. Scott, M.D. If you have been diagnosed with lung cancer, you are not alone. 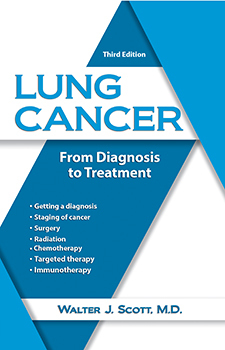 In fact, according to the American Cancer Society, nearly 224,000 Americans are diagnosed with lung cancer annually. It accounts for nearly 13 percent all newly diagnosed cancers. If you’ve been diagnosed with lung cancer, you probably have many questions. You’re wondering treatment and prognosis. What medical tests will you need? Which type of treatment will be recommended? Walter J. Scott, M.D., F.A.C.S.